Senior Policy Advisor, Science Strategy Branch, Industry Canada and Manager, S&T Economic Analysis Division, (formerly the S&T Data Intelligence Branch, Ministry of State for Science and Technology); responsible for advice, evaluation and analysis on federal S&T expenditures, S&T economic policy, and S&T and innovation performance measurement to senior management and Ministers. Program Analyst, Program Branch, Treasury Board Secretariat: responsible for advice, evaluation and analysis for the following portfolios: Science and Technology (including the National Research Council and NSERC), Transport (marine), the Canadian International Development Agency (bilateral, including IDRC), and Communications. Engineering Manager, Satellite Control Centre, Telesat Canada, responsible for the design, construction and launch operations of the first Telesat Canada satellite control centre. Member of supervisory committees for M.A. and Ph.D students in the School of Communication at Simon Fraser University and external examiner for theses at the University of British Columbia. Science and Public Policy, Research Evaluation, and Canadian Journal of Sociology : Referee for articles submitted. J.A.D.Holbrook : "Basic Indicators of Technological Performance", Science and Public Policy, Vol. 19, #5, 1992. 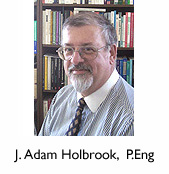 J.A.D.Holbrook : "Why Measure Science?" Editorial introduction to a special issue of Science and Public Policy on S&T Indicators, Science and Public Policy, Vol. 19, #5, 1992. J.A.D.Holbrook : "The Numbers Game; The Policy Dilemma", Proceedings of the Conference on Engineering Human Resources, Canadian Engineering Human Resources Board, Ottawa, 1991. D.W.Campbell and J.A.D.Holbrook : "International Cooperation and the Development of Institutional Arrangements on Energy", Improving World Energy Production and Productivity, Proceedings of the International Energy Symposium II, 1981. J.A.D.Holbrook : "The Application of Model Atmospheres to Synchronous Satellite Launches," Canadian Aeronautics and Space Institute Transactions, Vol. 8, #l, 1974. J.A.D.Holbrook : "The Application of Solar Flare Forecasts to Satellite Launches" Canadian Aeronautics and Space Institute Journal, Vol. 20, #10, 1974. G.F.Lyon and J.A.D.Holbrook : "The Focusing Effect of Satellite Radio Observations due to Travelling Ionospheric Disturbances", Space Research XII, Proceedings of the 14th COSPAR Plenary Meeting, 1971, Akademie Verlag, Berlin, 1972. G.F.Lyon and J.A.D.Holbrook : "An Isolated Field Aligned Irregularity", Journal of Geophysical Research, Vol. 74, #16, 1969.